On 15 January, major clashes in Tripoli occurred between anti-Libyan National Army (LNA) and pro-Government of National Accord (GNA) militias at Mitiga airport. The attack was reportedly part of a ‘prison break’ assault by the anti-LNA militias from Tajoura (east Tripoli). As many as 20 people were killed and more than 60 injured as a result of the fighting. On 27 December, the Libyan National Army (LNA) spokesperson Ahmed Mismari reaffirmed the LNA’s commitment to elections provided HNEC is restructured. The following day Haftar insisted that if elections don’t come to pass there is no way ‘but authorisation’ of the LNA to take power. The UN Envoy to Libya Ghassan Salame made a case to the UN Security Council on 15 November that the Libyan political process was on track. However, President of the HCS Abdurrahman al-Swehli criticised Salame for ‘ignoring’ consensus and ‘partnership’. On 19 November, a delegation of 29 HoR members was not allowed to land in Tubruq airport. The delegation was reportedly intending to vote on the new LPA amendment. On 10 November, the GNA military campaign against LNA-affiliated 4th Brigade in Wershefana concluded ‘successfully’. On 11 November, 28 bodies were discovered with bullet wounds and torture marks in Wershefana. On 10 November, Faraj Gaem, GNA deputy MoI in Benghazi, accused the LNA of trying to assassinate him, leading the LNA to arrest him and ban all GNA officials from eastern Libya. On 1 November, a new GNA-supported military campaign was launched in Wershefana against LNA-affiliated forces. It is led by Usama al-Juwaili and includes units from Zintan, Tarhouna, and Tripoli. 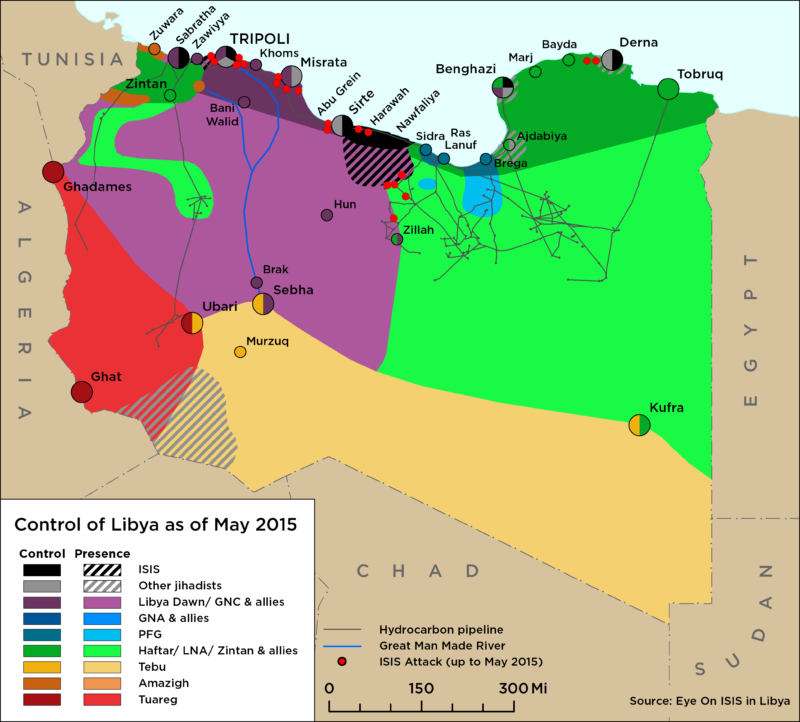 Talks in Egypt last week to unify the Libyan armed forces have stalled following the ‘mystery’ Derna airstrikes. On 30 October, airstrikes of unknown origin hit the Dahr al-Hamar and al-Fatieh districts of Derna. The strikes killed at least 12 children and women, and injured many more. Both the LNA and the Egyptian military have denied responsibility for the incident. The LNA said it had set an internal six-month deadline to conclude the ongoing UN dialogue talks or else the LNA would move on Tripoli. Clashes broke out in the center of Zawiyya and near the oil refinery on the evening of 30 October. 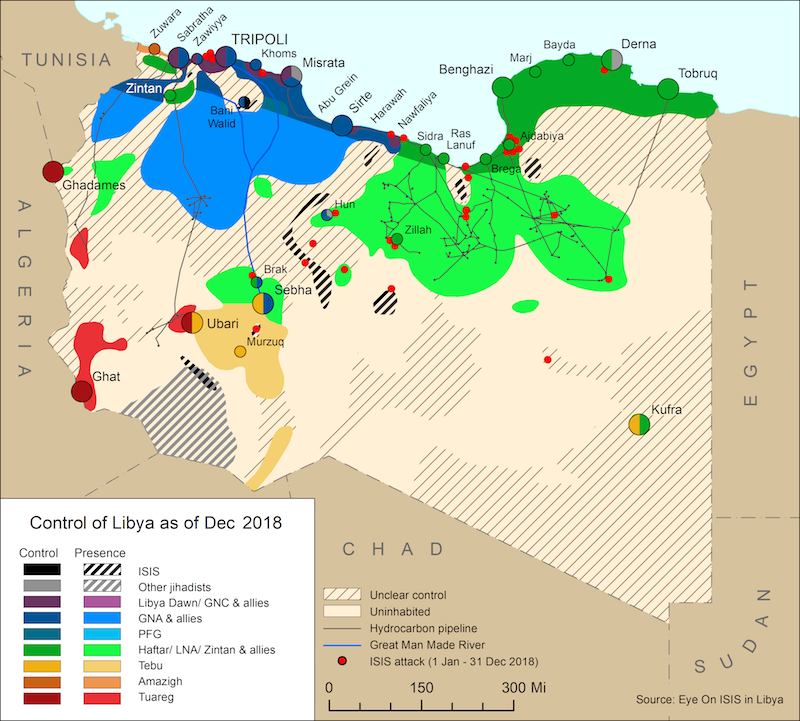 Since taking control over Sabratha in early October, Khalifa Haftar has strengthened his relationship with several important military leaders in the west of Libya. This week Misratan General Salem Juha, endorsed Haftar as leader of the national army. It is reported that Haftar met with the GNA’s Commander of the Western Region during his trip to the UAE earlier last week. On October 20, a large militia in Sabratha, the Sareyyat al-Orouba, turned itself over to the LNA-affiliated AIOR. On 17 October, intense clashes erupted at Tripoli port after the GNA’s Presidential Guard and the Nawasi Brigade tried to take the port by force. The Presidential Guard secured the facility on 22 October, and it is now operational. On October 19, the Megarha tribe cut off water supplies to Tripoli, in an effort to secure the release of Mabrouk al-Hniesh from Rada Special Deterrence Force. The clashes between the Dabbashi brigade and the more pro-LNA Anti-ISIS Operation Room have continued unabated in Sabratha with use of heavy artillery, despite attempts by different actors to establish a ceasefire. So far, 26 people have been killed, 170 wounded and thousands displaced from the city centre. In Tripoli, 2 Nawasi fighters were killed by Tajouri’s forces, sparking tensions.